Ice Cream Shops Limit Free Sample ScroungersMooch no more. Bulgarini Gelato Now Serving Culver CityHere’s to saving yourself a trip to Altadena! Bulgarini is Bringing Its Gelato to Culver City Next MonthThe superior sorbet and gelato will be served at Teaforest starting December 1st. A Whole Lot O’ Gelato NewsPlus some sorbet and fro-yo news, too! A Look at GelatoVino, Open Today in HollywoodGeorge Abou-Daoud opens new gelato and wine bar in Hollywood. Jessica Oloroso Followed Her Gelato Passion to Black DogJessica Oloroso of Black Dog Gelato tells where her flavors come from. Green Bean Coffee Serves Up Capogiro Gelato in GladwyneIn addition to gelato the coffee shop serves Chestnut Hill Coffee and housemade baked goods. Ugo Cafe Coming to Santa Monica PlaceThe Culver City Italian will be the mall’s only street-level dining option. Little Tokyo’s Mikawaya Turns 100The old mochi maker learns new tricks by putting gelato in its newest creations. Piccolo Is ClosedThe Ukranian Village gelato staple has closed. Lobster Gelato. For Real.Get your creamy crustacean at Da Vinci. Gelato Cart Returns to MidtownAnd doughnuts rejoin with frozen custard. 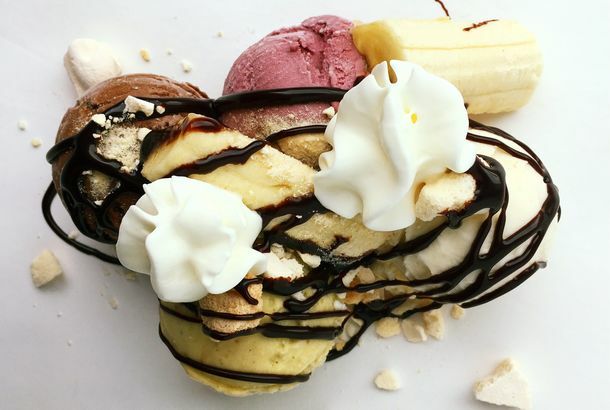 Ed’s Lobster Bar Ignores Patriotic Duty, Ditches Banana Split (Plus:The lobster bar is now exclusively serving Italian specialties from Il Laboratorio. Plus, other menu changes around town. Cheapo GelatoA pizzeria offers free scoops, and a Cinco de Mayo party featuring 50-cent Laboratorio del Gelato tequila scoops. Another Day, Another Artisanal-Pie Joint: A First Look at Midtown’s GolosiA slideshow of the latest fancy pies, sold by the inch. Spring Brings Gelato to Midtown EastA national franchise called Melt makes it to Manhattan. Old, Rich Wine Drinkers Immune to Economy; Food Chains Pick on Each Other in NewWhat to when a waiter serves you the wrong entrée in a restaurant, and gelato that comes from a tanning salon, from our glance at the morning headlines. Restaurant Ice Cream to GoA handful of sit-down restaurants hoping to cash in on summer ice-cream cravings have started selling creamy, pastry chef–approved servings to go. We sampled their results, and offered our own superlatives.